Mike Ullery | Daily Call Robert Doolin, 102, lights a candle during a remembrance ceremony at the Crown Plaza Hotel in Dayton on Saturday. Doolin, a member of the 92nd Bomb Group was one of more than 60 surviving members of the famed 8th Air Force who gathered for a reunion in Dayton last week. Mike Ullery | Daily Call Members of the United State Army Air Corps 8th Air Force, the “Mighty 8th”, gathered in Dayton last week for a reunion. More than 60 of the World War II veterans met in this annual event. On Friday, the vets visited the National Museum of the United States Air Force. The toured the museum and gathered at the famed B-17 Memphis Belle where they spent several hours recording a documentary with a film crew for HBO and sharing their stories with museum visitors. The 8th Air Force introduced Daylight Precidsion Bombing and were the first to take the war back to German soil. The group suffered more than 47,000 casualties and more than 27,000 members died in combat during the war. Robert Doolin, 102, lights a candle during a remembrance ceremony at the Crown Plaza Hotel in Dayton on Saturday. 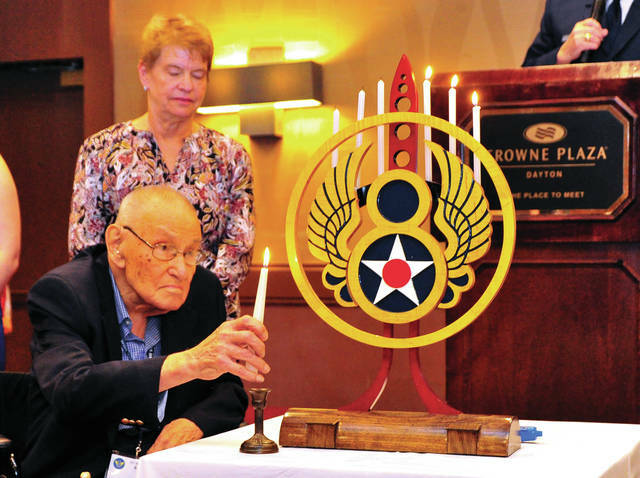 Doolin, a member of the 92nd Bomb Group was one of more than 60 surviving members of the famed 8th Air Force who gathered for a reunion in Dayton last week. Members of the United State Army Air Corps 8th Air Force, the “Mighty 8th”, gathered in Dayton last week for a reunion. More than 60 of the World War II veterans met in this annual event. On Friday, the vets visited the National Museum of the United States Air Force. The toured the museum and gathered at the famed B-17 Memphis Belle where they spent several hours recording a documentary with a film crew for HBO and sharing their stories with museum visitors. The 8th Air Force introduced Daylight Precidsion Bombing and were the first to take the war back to German soil. The group suffered more than 47,000 casualties and more than 27,000 members died in combat during the war. https://www.urbanacitizen.com/wp-content/uploads/sites/36/2018/10/web1_101318mju_8thAF1-1.jpgMike Ullery | Daily Call Robert Doolin, 102, lights a candle during a remembrance ceremony at the Crown Plaza Hotel in Dayton on Saturday. Doolin, a member of the 92nd Bomb Group was one of more than 60 surviving members of the famed 8th Air Force who gathered for a reunion in Dayton last week. https://www.urbanacitizen.com/wp-content/uploads/sites/36/2018/10/web1_101318mju_8thAF2-1.jpgMike Ullery | Daily Call Members of the United State Army Air Corps 8th Air Force, the “Mighty 8th”, gathered in Dayton last week for a reunion. More than 60 of the World War II veterans met in this annual event. On Friday, the vets visited the National Museum of the United States Air Force. The toured the museum and gathered at the famed B-17 Memphis Belle where they spent several hours recording a documentary with a film crew for HBO and sharing their stories with museum visitors. The 8th Air Force introduced Daylight Precidsion Bombing and were the first to take the war back to German soil. The group suffered more than 47,000 casualties and more than 27,000 members died in combat during the war.